Popovers are, or at least my goal is to make them be, virtually hollow inside, a little custardy, with a delicious crusty/chewy brown exterior. Steam escapes as we break them open and dip into a puddle of maple syrup. A dab of raspberry preserves is another taste treat. Butter is a traditional condiment. This recipe has less than half the fat, more protein, and triple the fiber of a traditional recipe. And they still pop! 1 Preheat oven - and popover pan - to 450°F. 2 Allow milk, eggs, and flour to come to room temperature. This step is not negotiable. 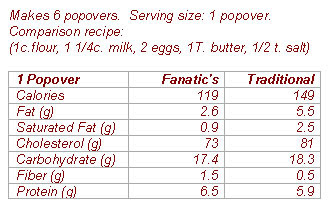 Note: You can substitute low-fat or whole milk for the fat-free milk. Milk can be microwaved for a few seconds to speed warming. Microwaving eggs is not recommended. 3 Sift salt with flours. Whisk eggs and egg white in a medium-sized bowl. Whisk in milk. Whisk in melted butter. Whisk in flour, stirring thoroughly to break up lumps and create a smooth batter. Let the batter sit at room temperature for at least 30 minutes, preferably one hour. This waiting period is also not negotiable. Notes: Using all all-purpose flour works best in this recipe. I've substituted white whole wheat flour for 1/2 of that, with good results. When I use more whole wheat flour the results are not as puffy and a little heavier but certainly not inedible. I have pop-over success without using baking powder. 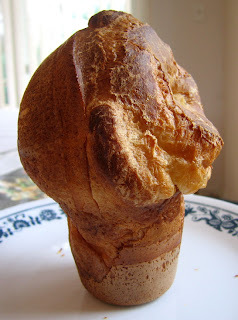 You can use a pinch (1/4 teaspoon) if you find your popovers fail to popover. Many recipes will instruct to whisk the batter just until small lumps appear. This advice is more suitable when a leavening agent such as baking soda is used; a lumpy batter slows the leavening reaction during mixing, keeping acid and base away from each other until baking is underway. Since popovers rise with steam, this keep-batter-lumpy instruction is moot. In fact, the waiting period I describe as not negotiable encourages formation of gluten which creates a strong framework as the popovers puff. Gluten is formed when water contacts wheat protein, and breaking up lumps puts more moisture in contact with protein. 4 Carefully remove the popover pan from the oven, spray cups with oil (one instance PAM is useful), ladle batter evenly into cups (they'll be about 1/2 full), get pan back into hot oven pronto. 5 Bake for about 20 minutes at 450°F until puffed and golden. Reduce oven temp to 350°F and bake for another 15 minutes. Remove popovers from pan immediately, sliding a knife around edges if they stick. Serve immediately. 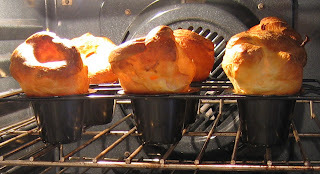 Note: If you'll be holding popovers before serving, they can be kept warm in a very low oven. Slit them gently to let steam escape - this will keep them from collapsing, although you'll forfeit the steamy tableside opening. What's life without steamy tableside openings. this turned out wonderful - i used a 2% milk, and a ramekin, to bake - thought u should know. Being from England, Yorkshire pudding, aka popovers are traditionally eaten with a lamb or roast beef dinner and have gravy on them, not maple syrup or jam.